It’s spring and I’m addicted to iced coffee. 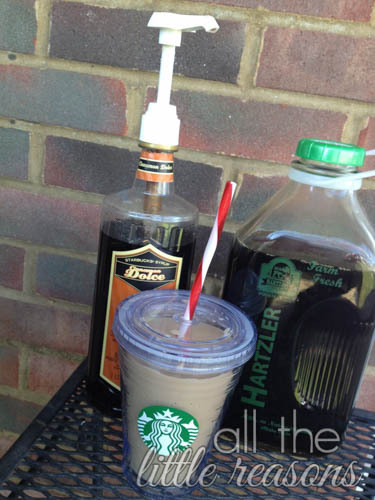 I love the strong iced coffee from Starbucks, but it’s SOOOO expensive! Fortunately, Starbucks sells all the things they use to make their iced coffee and I can replicate it at home for so much cheaper! A few years ago I found a recipe at The Pioneer Woman’s site that explained how to make a cold brew iced coffee, and it has changed my life. Interestingly, I learned that Starbucks brews theirs hot and super strong and then pours it over ice to cool it. When I was reading up on cold brewed, I learned that it is significantly less bitter when it’s not exposed to heat. It’s truly amazing. 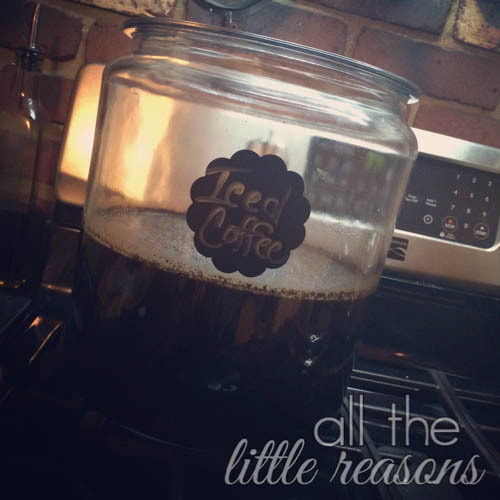 The only bad thing about the recipe I found was that it made 2 gallons, which I thought was excessive even for my huge love of coffee. Here’s the scaled back version that I use. Start with a really good, strong ground coffee. 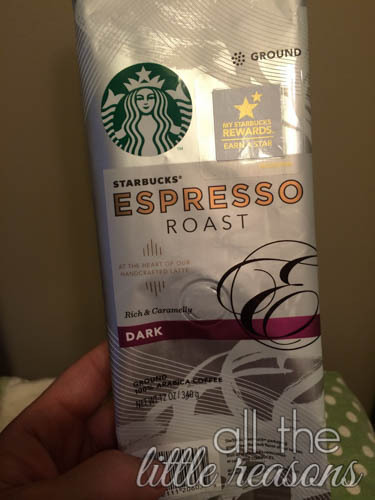 I like this expresso roast from Starbucks. 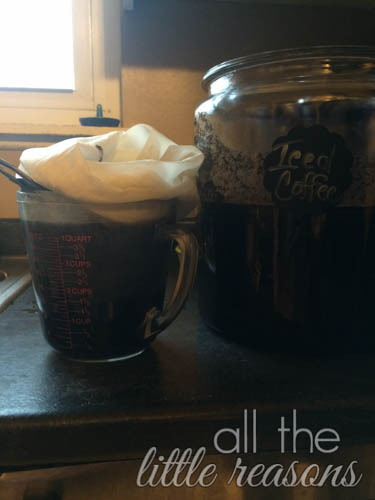 Mix 1/2 pound ground coffee with 1 gallon cold, filtered water. I measured this out today and 1/2 lb. with the grind I was using turned out to be 2 3/4c. If it’s a super fine grind, it could be more like 2 2/3c. Stir until all the grounds are in contact with the water. Cover and leave on your counter overnight or longer. Starbucks just introduced a new cold brew coffee and the barista told me that they brew theirs for 20 hours! So overnight for sure, but up to 20 hours. 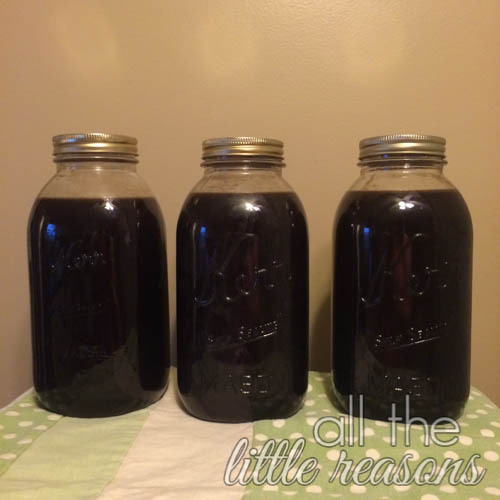 I brewed mine in this big 2 gallon container and it worked really well since it will overflow a 1 gallon container. 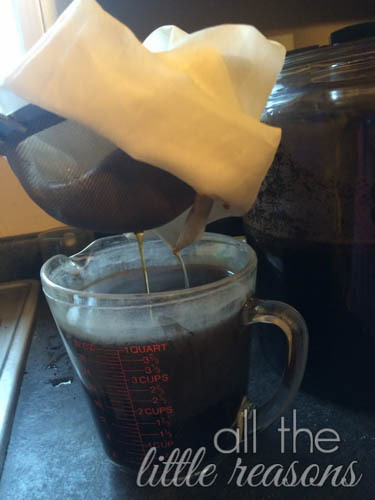 After it has steeped, pour it through a fine mesh strainer with cheesecloth inside it. I think I was using a nut bag (for almond milk) in the pictures here. It takes a while to strain it. That’s why it’s so much more worth it to make it once every few weeks. It’s time consuming to strain, so I’d rather not do it weekly. When it gets down to the bottom of the container, I usually use a spoon to move the grounds around and get all the liquid through. You can store this in mason jars in the refrigerator. I have kept mine as long as a few weeks and it’s still yummy. It’s meant to be served cold, so refrigerate it before using. I love to make mine in the morning and strain it just before bed. That way it can chill overnight and be ready for the morning. When you’re ready to drink it, fill your cup up with ice and then fill it halfway with the coffee concentrate. Fill the other half with unsweetened almond milk or regular milk. I like mine pretty strong so I fill it most of the way up with coffee and add half and half. To sweeten it, you’ll need to use a liquid sweetener in order for it to dissolve. I’ve used liquid stevia (or regular since it’s really finely powdered), agave, or simple syrup. To make simple syrup, just mix 1c. water with 1c. sugar and heat it until the sugar dissolves. Super easy. Store in a mason jar in the refrigerator. My favorite way to drink it is to purchase one of the syrups from Starbucks for $10 (make sure to ask for a pump!) and use that in the coffee. It’s exactly what you buy there! As a side note, I also use the cinnamon dolce syrup in my copycat Carmel Apple Spice drink. It’s that easy. Make it once and enjoy it for weeks! This is a huge show stopper at events like bridal showers, weddings, baby showers, etc… I made gallons of it for my niece’s wedding and put it in adorable beverage dispensers with instructions printed and placed in a picture frame next to it. 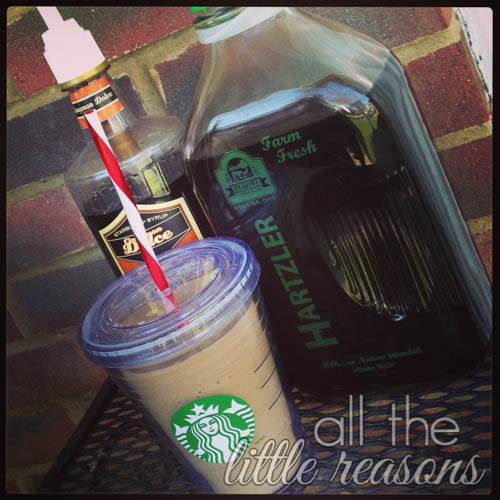 We bought a few flavors of the Starbucks syrup (and made sure to get the pumps to dispense it easily), bought a couple half gallons of half and half, filled another bucket with ice and a cute silver scoop and served it in pint mason jars. It was a hit! So impress others with your mad coffee skills and make this for your next event! Add 1/2 lb. strong ground coffee to 1 gallon cold filtered water. Depending on how finely ground the coffee is, 1/2 lb. is approximately equal to 2 3/4c. Mix until the coffee grounds all have contact with the water. Cover and leave on the counter overnight at least, and up to 20 hours. Strain through cheese cloth in a strainer or a nut bag in a strainer. 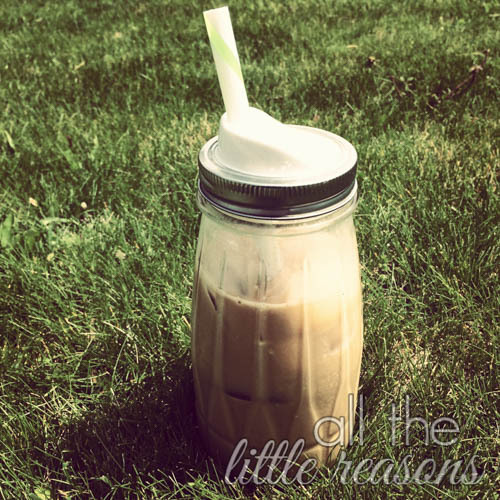 Keep concentrated iced coffee in refrigerator for a couple weeks -- if it lasts that long! Serve with lots of ice, a splash of cream and liquid stevia. Alternately, you can purchase the syrups from Starbucks. Make sure to ask them for a pump!